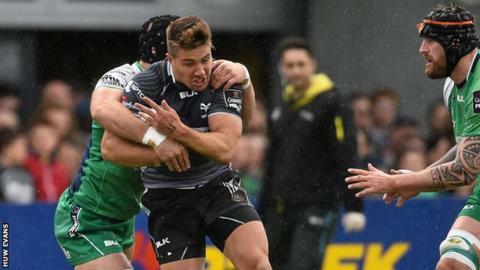 Ospreys forwards coach Chris Gibbes blamed a poor second half against Connacht for letting a home spot in the Pro12 play-off semi-finals slip away. The Welsh region still won 24-20 in Galway, scoring three first-half tries. But the lack of a fourth try for a bonus point meant Glasgow and Munster leap-frogged Ospreys to claim home advantage next weekend. "It's a bit of an empty feeling to be honest, particularly when we played so well in the first half," Gibbes said. "We dominated the game, dominated territory, we really put our mark on them. "But coming out in the second half we made a couple of early errors and that started to compound the pressure. "In hindsight we'll take the learning out of this. but at the moment I'm feeling a wee bit empty. "We've still won the game, we're still in the play-offs, we're really happy with that, but again it feels like an opportunity lost. Alun Wyn Jones pleased with Ospreys' 24-20 win over Connacht but disappointed not to have secured a home semi-final draw in the Pro12 play-offs. "Just in the last five minutes or so we knew we needed to score and again we tried to put some speed into the ball, but we just weren't accurate enough." Ospreys must now travel to play Munster on Saturday, 23 May, while the other semi-final sees Ulster go to Glasgow on the Friday night. The Welsh region have already won at Thomond Park this season, a 19-14 victory back in September. While Gibbes says that result gives confidence, he knows how hard the task will be for Ospreys to repeat their success. "We learnt a lot about our group at that point in time of the season, that we can stay in the fight," added the New Zealander. "We're pretty happy about that and pretty positive we learnt that, we've just got to make sure we're a lot more accurate. "All bets are off now and it comes down to 80 minutes of rugby. "We've just got to make sure that when we get out to Munster we turn up and we play how we want to play. "It's a huge challenge, it's a pretty hard place to go and play... but it's a hell of a challenge and something we're really looking forward to. "We're not intimidated by going out there, we just want to make sure we get ourselves right and go and play."